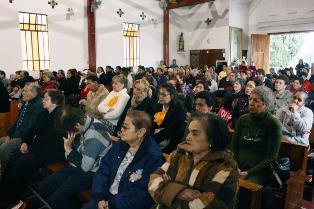 On the morning of March 8, the Blessed Mother of God in Her Icon of Our Lady of Czestochowa attended breakfast offered from 7:30am in the Parish of St. John Paul II & St. Thomas More, before beginning her journey for a week visit to St. Francis de Sales parish, in the city of Mexico, 13.5 km. from her Mexican residence. It should be highlighted that for the last 7 years every Sunday, a group of St. John Paul II & St. Thomas More parishioners offer breakfast to people who are in situations of high vulnerability, including children and the sick. Once they have breakfast, the congregation give them clothing and other things that the community shares. Many come from far away knowing that here they will have the breakfast -in most cases- it is the best food they have in a week. Fr. Luis A. Monroy, parish priest and the custodian of Our Lady, invited some of these beneficiaries and six of them had the privilege of carrying the icon and the image of Jesus of Divine Mercy (copy of the image done for Saint Faustina in Vilnius, Lithuania) to the transport vehicle. 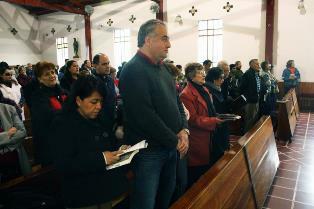 St. Francis de Sales parish has five Masses every Sunday. Therefore, Our Lady was already there before the 9:00am Mass, the first one of the day. During the week from March 8 to 15, Our Lady accompanied various parish groups in their activities both on Sunday and during the week. This included daily Mass at 7:00pm and pastoral groups with the aim of promoting and encouraging the faith of the community. 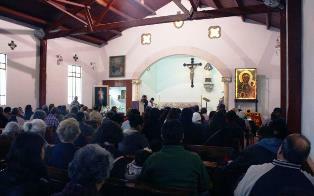 The parish, under the patronage of St. Francis de Sales (patron of the media, social communications and Doctor of the Church) gathers in a small church, with tiled roof built around the 60´s. Since its founding, it was assigned by the Archbishop of Mexico to the Missionaries of the Holy Spirit, the family with the spirituality of the Holy Cross and the Holy Spirit, founded by Concepcion Cabrera de Armida, a Mexican, and Pbro. Félix de Jesús Rougier, a native of Lyon, France. By 1968, says Ms. Delia Martinez Skoryna who serves as a catechist and resident of the area, the pastor was Fr. Miguel Uribe, a missionary of the Holy Spirit who was there for 30 years. It is perhaps because of this origin, that the pastor during the preparation of the visit shared that his parish is in possession of the relics of the Holy Cross. Both the pastor Fr. Mario Martinez Contreras and Fr. Omar Bautista Oropeza, who assists him on the weekends, attended the icon Welcome ceremony with the Skoryna family and community members. Both images ware carried in a small procession and placed on both sides of the altar. The icon to the right side of the Church and image of Jesus of Divine Mercy, to the left. During the homily the community could learnt the history of Our Lady of Czestochowa. At the end of each Eucharist the Act of Entrusting the protection of the civilization of life and love into the hands of the Most Blessed Virgin Mary, (of the Pilgrimage "From Ocean to Ocean") was recited. At the foot of the icon a chest was placed so that the faithful could deposit their testimonies, offerings and prayer requests. 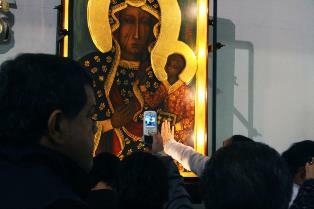 At the end of every Mass the people could approach the icon to contemplate it up close, venerate, and take pictures. The delegation of families of VidaFlorida Foundation remained with the Black Madonna for the first 3 Sunday morning Masses. It was a beautiful experience to attend the 11:00am Mass because it was for children who were with their parents. Fr. Omar told them that they have a very important visitor coming from far away. He told the children the story of the Virgin as a real story where there were castles, kings and princesses. At 12:00 Mass Fr. Omar invited everyone to discover different ways how our Mother communicates. Explaining that devotion to Our Lady in Mexico, naturally takes us to her Guadalupe image. But this is the same Virgin Mary, in any way, at any context she always leads us to meet the Lord and urges us to love Jesus and that we approach the sacraments He instituted. He also mentioned the International Women's Day and what Pope Francisco had said that morning about a world that has no respect for women is a sterile world. From the parish there was a live connection via internet with the program "The Hour of Hope" for radio Minuto de Dios station, based in Bogotá, Colombia with the message Our Lady of Czestochowa. In this historic time of the World Pilgrimage she showed real womanhood. We learnt that incarnation of the Word was by the humble but courageous "yes" of Mary. During the week Our Lady in her pilgrimage visited some areas of the parish, allowing personal contact of all the faithful with the Mother of God and to read in her eyes the tender call to give us the courage to defend life from conception to natural death. 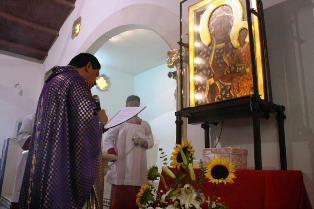 The icon remained until 1:00pm Mass on Sunday March 15th. After that, She was transferred to the community of the Apostolic Sisters of St. John who live on the third floor of the Emergency Hospital of the Mexican Red Cross, where they get the most injured and suffering people.